Thanks to blog reader "J" who sent this my way. 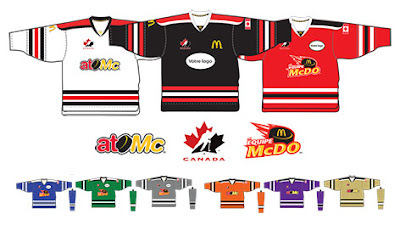 It's atoMc hockey and in the tradition of Hockey Canada selling access to your children (something I blogged about a few months ago), comes McDonald's atoMc hockey. What do your little bundles of targeting marketing get from McDonald's? Free hockey jerseys and toques, McDonald's coupons for teams (that almost certainly will be used to reinforce the notion of fast food as a deserved reward for exercise and/or for celebration), a "Golden Moment" jersey, and "more". "The atoMc Hockey, Hockey Canada or Golden Arches logos cannot be obstructed by any other logos"
McDonald's also has 3 hockey superstars helping to hammer home how great they are into your children's young hearts and minds. Truly brilliant marketing for McDonald's as it ties the incredibly powerful emotions of sport, competition, victory, camaraderie and joy to their restaurants in the minds of 9-10 year olds. How better to foster lifelong brand loyalty, and all for the cost of a jersey. Guessing too - if your kid happens to be on a team where the coach has decided to apply to join the program, your only recourse if you don't want them exposed or involved is to pull them from the sport. Because of course parents can always "just" say "no".